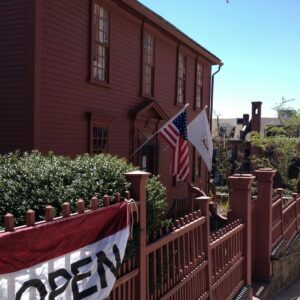 Providence is a city with a rich history and walking tours of the city, its historic architecture, and visits to the significant houses open for visiting provide a fascinating view of our interesting past. Take a walking tour with one of our knowledgeable staff and volunteers to get an inside look into the history, theory of design and management of WaterFire. Get the inside story of WaterFire with an exciting walking tour that begins at 7:00 p.m. This reservation only tour allows those who want to learn the ins, outs, and background of the magic of WaterFire. For a donation of $10 registrants will walk the length of the canal with a tour guide and land at the basin just in time for lighting. Email connie@waterfire.org for detailed information. Purchase a ticket online for our June 30th lighting. 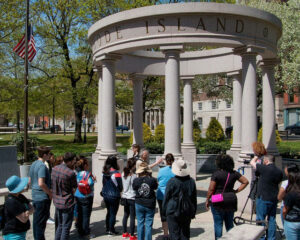 Welcome to the INDEPENDENCE TRAIL of Providence, Rhode Island – a 2.5-mile tour of Providence that takes in over four centuries of history, architecture, culture, and folklore. 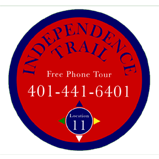 Using the Trail is easy – it is marked by a green line that is painted on the sidewalks of Providence. The Trail is circular so there is no “beginning” and no “end” – just start and head in either direction – in 2.5 miles you will be back where you started. During that time you will have traveled through over 4 centuries of American history, architecture, culture, and folklore.